In the upper left hand corner, St Anthony is shown as a young man giving away all his money to the poor; St Athanasius, who wrote his life, records that he began his embrace of the monastic life after hearing in church the words of the Gospel of St Matthew, (19, 21) “If thou would be perfect, go and sell that thou hast and give it to the poor; and come follow Me, and thou shalt have treasure in heaven.” Below that, a devil appears in the form of a woman to tempt him to lust, and at the bottom, devils beat and torment him. In the upper right hand corner, Christ Himself, accompanied by two angels, appears to Anthony and blesses him. 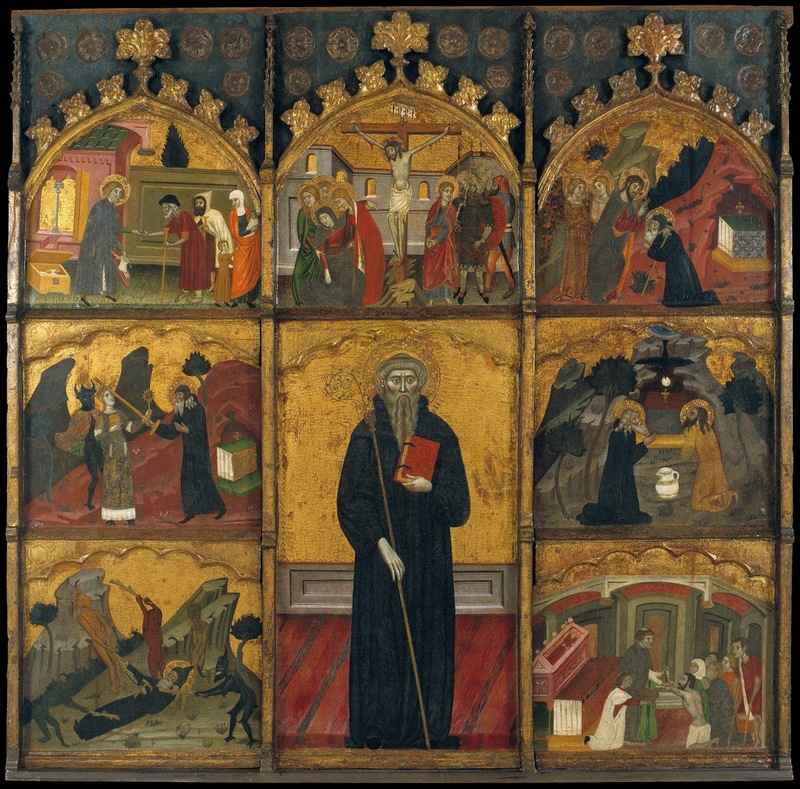 The central panel of the right side depicts a famous episode which is not, however, recorded by St Athanasius, but in St Jerome’s life of St Paul the First Hermit. On the day when Anthony came to visit Paul for the first time, unannounced, a raven which had brought Paul half a loaf of bread every day for sixty years, brought him a full loaf instead. (It has been guessed that the word “raven” reported to St Jerome may be a misunderstading of “Arab”, since the two words are similar in some Semitic languages.) The artist was very careless to show Paul younger than Anthony; when they met, he was 113, and Anthony 90. Paul’s garment has hash-marks over it, to show that it was woven from palm fronds; St Jerome records that Paul died very shortly after his meeting with Anthony, who buried him, then took this garment with him, and wore it each year on Easter and Pentecost. In the final panel, miraculous healings take place before Anthony’s tomb.